Broccoli can be a finicky crop, but in the right conditions, it can be a pleasure to grow and eat. It, along with other members of the brassica family, offers great nutrition, with lots of vitamin C as well as a healthy serving of vitamin A, fiber, calcium, and iron. In addition, the greens and flowers can be eaten as well as the heads, in a variety of dishes. It can be prepared by steaming, roasting, grilling, broiling, and a variety of other methods, and may be eaten as a side or part of a main dish with other crops from the garden. Farmer Gowan Batist explains that broccoli needs a mild consistent climate where temperatures do not vary dramatically from day to day, because sudden temperature drops and spikes can cause broccoli to bolt. When it bolts, it puts out a flower stalk instead of heading up, and rapidly turns woody and bitter as the plant puts its energy into the flowers. Since broccoli can take from 50 to as many as 220 days to fully develop, it needs a stable climate for an extended period of time while it grows, which can be a challenge in some regions. Temperate zones without too much heat or cold are ideal, and while broccoli is hardy to around 15 degrees, it will need to be covered at night in extreme temperatures. It is possible to grow broccoli outside of temperate zones, but you’ll need to take some extra steps to make it work; you’ll need to plan on controlling its environment by growing in a hoop house or under garden blankets. Several issues can make traditional heading broccoli a poor choice for beginning gardeners, Batist explains. The slow maturity time is one issue, but the plant is also large, taking up significant space in the garden while it grows. It requires a lot of nutrients and can become fibrous and tough if it bolts or doesn’t get enough water. People might find heading broccoli appealing because it’s a familiar vegetable, but they should think carefully before committing to trying it in the garden. 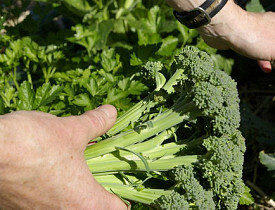 Instead, she suggests sprouting broccoli, which puts out small florets and tender leaves, and is much easier to grow. Di Cicco and purple sprouting broccoli are both potential winners in the garden, and gardeners can overwinter them, “planting in late summer to harvest in the spring,” to avoid the worst of the warm weather and reduce the risk of bolting. These broccolis pack the same distinctive crunch and flavor as their heading cousins, without the hassle. Gardeners should plan on using “well amended, fluffy organic soil” for their broccoli. “Worm tea [as a fertilizer] is fine if it's not overdone – too much nitrogen encourages leafy growth more than we always want,” Batist explains. While broccoli leaves are edible and can be quite tasty, people looking for more traditional florets want to be careful about encouraging too many, as the plant will put all its energy into making leaves rather than florets. If the plant starts to bolt, the flowers can be cut and eaten, but the broccoli will quickly go woody and may not be edible for very long. For gardeners intimidated by broccoli, Batist explains, “An easy cultivar to try if you like broccoli but have less space is purple peacock. A natural cross, not a genetically modified organism, of kale and broccoli, it gives a small purple central floret, really tasty leaves, and small side florets.” The leaves can be harvested continually by taking outer leaves and leaving the center portion intact so it will keep producing, allowing you to eat from one plant for several weeks or even months if your climate is mild. This Networx writer can testify personally that it’s quite delicious, and a colorful alternative to broccoli. s.e. smith writes about Bay Area carpentry and roofing for Networx.